Occasionally an art exhibit meets a space perfectly suited to its concept; this is happily the case with Trill Matrix, on view through Jan 19th at the Abrazo Interno Gallery, Clemente Soto Vélez Center. Trill Matrix, conceived as a site-specific exhibit for the Center, is curated by artist Elizabeth Riley and features works by contemporary artists Nancy Baker, Jaynie Crimmins, Christina Massey, Elizabeth Riley, Christine Romanell, Linda K. Schmidt and Etty Yaniv. These artists frequently exhibit collectively: while each is firmly rooted in their own unique artistic practice, their dialogues and discussion form interstices linking the works on view in Trill Matrix. Showcasing a blend of sculpture, mixed media, and installation works, Trill Matrix showcases ways in which contemporary art can tease our senses. From texture to color, volume to light, Trill Matrix teases aspects of reality into new, uncharted territory for all who visit. On view at the The Abrazo Interno Gallery (107 Suffolk Street) through January 19, make sure to visit during the show’s final days – if you can, catch the closing party on Sat, 1/19! Free and open to the public – come and celebrate art while also celebrating the network of women artists behind the works, a perfect way to close out the Women’s March events in NYC! Christina Massey, “Crafty Collusion 2” on view in Trill Matrix. 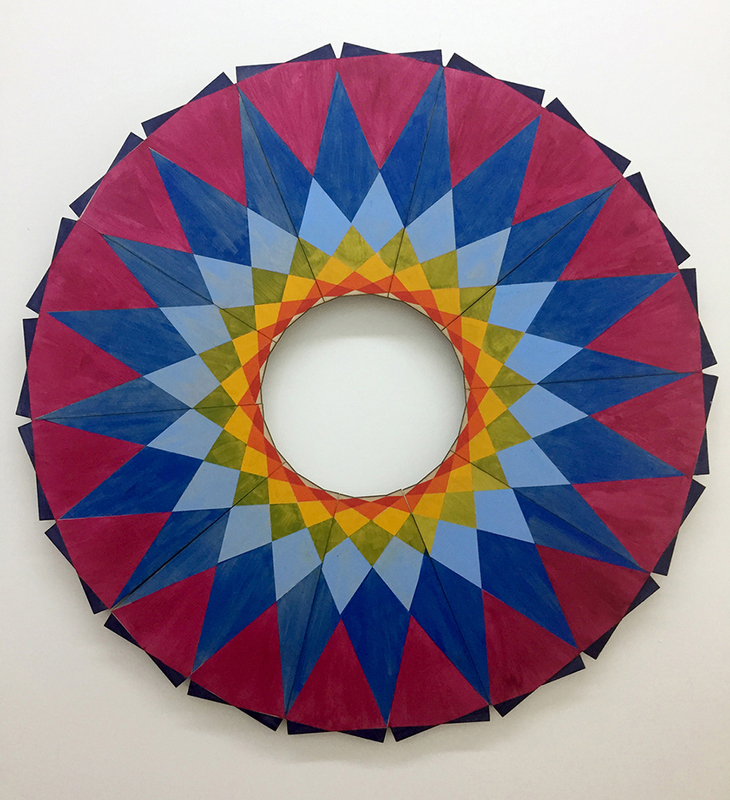 Elizabeth Riley, “Prototype 2 – Canopy” on view in Trill Matrix. In Trill Matrix, “trill” alludes to a moment in hip-hop culture where the words “true” and “real” blended together to suggest authenticity and cultural ascendancy. Playing off this idea of reconciling two distinct words, artists on view in the exhibit remix disparate mediums to form new hybrids. Strips of fabric gathered together form a soft-sculpture-turned-light-installation, while works composed of glass and aluminum fragments hold court with another work re-claiming electronic wires and plastic into a single immersive sculpture. The network these works forms invites closer inspection, often bringing the visitor to realize a greater understanding of the beauty that lies in waste. Elizabeth Riley‘s artwork, “Prototype 2 – Canopy”, slows down new media by imprinting video stills onto paper and fusing these frozen scenes with aluminum, paint and duralar, a form of acetate. Fusing different modes of representation and interpretation, Riley questions our subjective experience of reality – whether through new means of looking and questioning or by forcing the viewer to re-think what they are observing in her mixed-media works. Artist Jaynie Crimmins similarly plays with both ideas around reality depicted through material and notions attached to craft. The artist shreds promotional mail she receives – catalogs, flyers, etc – into minute pieces that she then re-arranges into abstract geometric compositions. Reminiscent of the cardinal directions and visually capturing a format found in the most ancient cultures, Crimmins compiles works with muted color tones and fantastic textures to witness that one woman’s trash can become the world’s treasure. Jaynie Crimmins, “A Field Guide to Getting Lost#7” on view in Trill Matrix. Linda K. Schmidt, “Panels 50+51+52+53” on view in Trill Matrix. Linda K. Schmidt‘s work embodies another style of geometric abstraction, with strips of semi-sheer fabrics in block colors meticulously arranged to form striped patterns. Evoking stained glass windows or dress-making patterns, Schmidt brings color field painting and craft together in one transcendental visual form. Suspended from the floor, larger than life size, these installations induce a sense of wonder in visitors encountering her installations at Trill Matrix. Works by Nancy Baker display a skillful assimilation of sublimation into striking visual compositions. Recalling networks of neurons, or perhaps a private eye’s visuals connecting elements of an investigation, Baker’s installation for Trill Matrix ventures as many layers deep as the visitor is willing to explore. A New Yorker by birth, Baker also plays off the idea of linked infrastructure such as that found in the NYC subway; yet, her compositions incorporate found language indicating our current social anxiety and uncertainty. 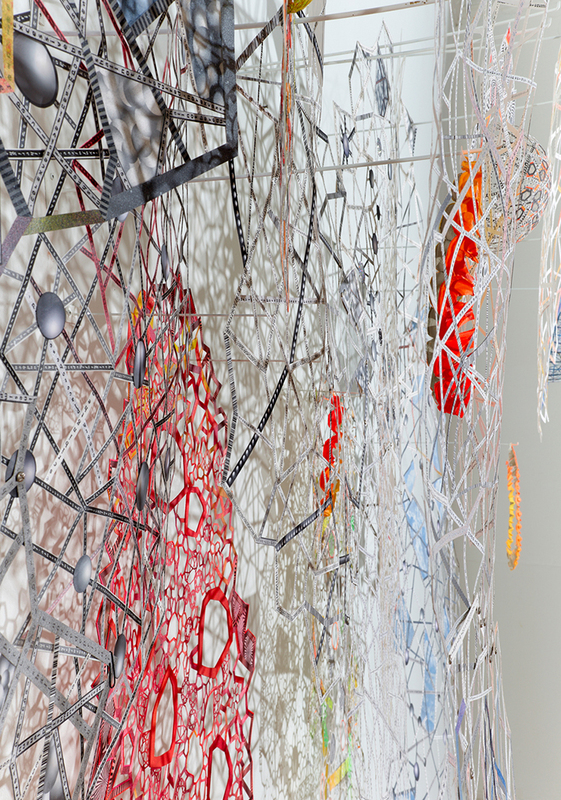 Nancy Baker, “Shredded Cold Victory” (detail image), on view in Trill Matrix. Christine Romanell, “Dah Noqte” on view in Trill Matrix. Artist Etty Yaniv plays with color and texture to reference abstracted nature through sublimely arranging upcycled materials into organic, yet repetitive, patterns. Blending networks of cords and cables into fragments of materials from discarded paintings and used plastic, Yaniv draws out the inherent beauty of detritus. Her work plays with notions related to unity and disparity, tracing harmony and dissonance through her playful use of scale and masterful composition. Christine Romanell‘s work brings mathematical formulae and data analysis into the visual arts sphere. Applying color to patterns derived through mathematical equations, yet identifying where math also traverses organic and non-repetitive functions, Romanell’s installations make visual the corners of rationale and analysis where making sense begins to break down: with beautiful results. Don’t miss the final days of Trill Matrix! Make sure to witness for yourself this stunning survey of the possibilities present within a mindful collection of connected yet disparate mixed media artistic practices.